An actual picture one buyer sent my realtor as "proof of funds" for a cash offer on my house. I figured selling our home would be easy. 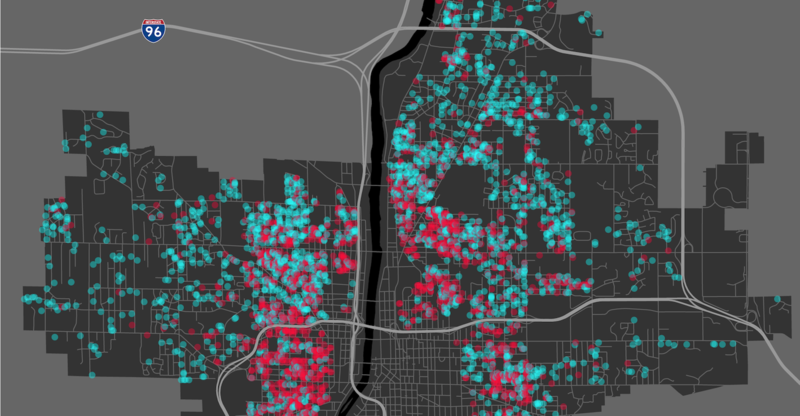 Grand Rapids’ housing market is one of the hottest in the country right now. But I did not expect to swallow such a queasy feeling that I made out like some kind of gentrifying bandit. I bought my house in late 2013 for a mere $65,000. A steal, I know, but that was back when 1 in 3 homes in the Grand Rapids/Wyoming metro area sold for less than $100,000, according to numbers from the Grand Rapids Association of Realtors. Now, fewer than 1 in 6 low-to-moderate income buyers are lucky enough to score a house for that price here. My colleague and fellow Grand Rapidian Dustin Dwyer produced a whole documentary, Pushed Out, about the market boom in April. Within the last year, the realty company Zillow reports home prices within the city limits rose 12%. In some neighborhoods, rents rose nearly 20%. The money and people pouring into the city are transforming my neighborhood, the Baxter neighborhood. 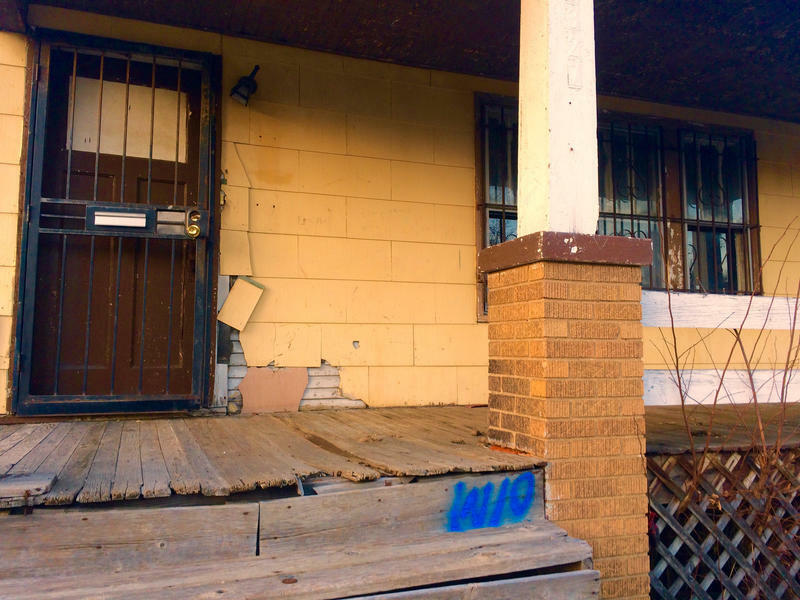 When I moved in, I counted at least a dozen houses in a two-block area that were boarded up. Now, there are rarely any vacancies at all. The plywood boards have vanished. Young, white college students are moving in. Here’s how I can tell how crazy things are: This week I sold my house for $135,000. What I’m writing here today is personal, but I felt the need to share my home’s story to illustrate a very obvious truth: In today’s housing market, I would never be so lucky as to be able to buy my house. There used to be two houses on the property where my house in Grand Rapids sits now. Looking at old records from the city’s archive, it appears two Dutchmen built them, somewhere around 1910. 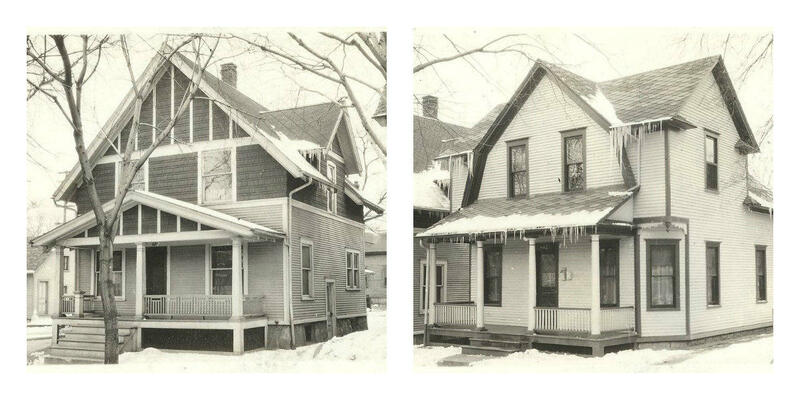 Pictures from Grand Rapids' city archives show the two houses that once stood where my house is now. These are from 1936. But in the mid to late 1930s, federal housing agencies assessing the outlook of my neighborhood for mortgage lenders and appraisers gave it a “D” rating; the worst one could get. What’s known now as the Baxter neighborhood got high marks for its proximity to downtown, good transportation and schools. But the “type of dwellings and inhabitants” brought the rating down. Baxter is still a predominantly black neighborhood. About 67% black or African-American, 20% white, 6% Hispanic or Latino, according to U.S. Census estimates. By 1976, one of the two homes was condemned. It was razed in 1977 and never rebuilt. In 1991, after some upgrades, the owner of the second house listed it for $39,000. It doesn’t appear the house sold. A clipping from The Grand Rapids Press on August 24th, 1992 I dug up at the library. But on August 23, 1992, a fire broke out at the home. 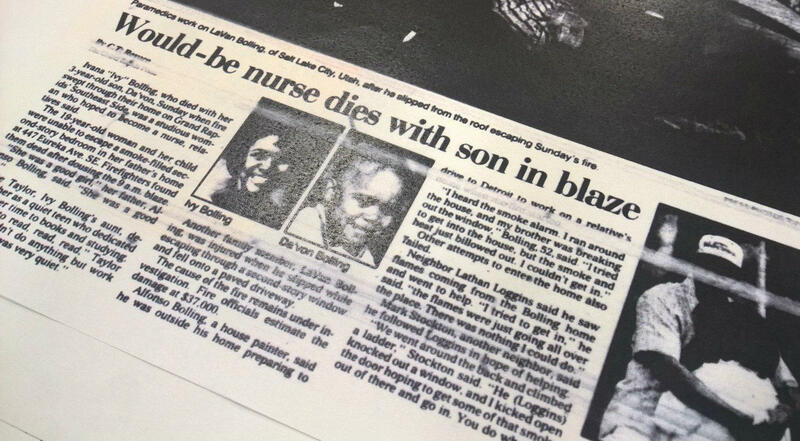 Accounts I dug up from The Grand Rapids Press say a “studious” 19-year-old “would-be nurse” and her three-year-old son died in the fire. She had just graduated from Ottawa Hills High School, enrolled in community college, and was working as an attendant at a city parking ramp. The house that once stood where mine is now suffered major fire damage in 1992. The fire killed two people, according to newspaper accounts. The house was razed in 1993. The property sat empty for more than a decade. In 2005, Inner City Christian Federation, a non-profit with a mission to provide affordable housing, bought these and other vacant properties in Baxter as part of a package deal. The price for all five properties was less than $10,000. It cost ICCF $114,950 to build my house in 2005. ICCF CEO Ryan VerWys guesses the organization rented out the new house under a now-defunct lease-to-own state program. In 2011, ICCF sold the house for $59,000. “Well, we are a non-profit,” VerWys says, when I ask why they sold it for less than it cost to build. 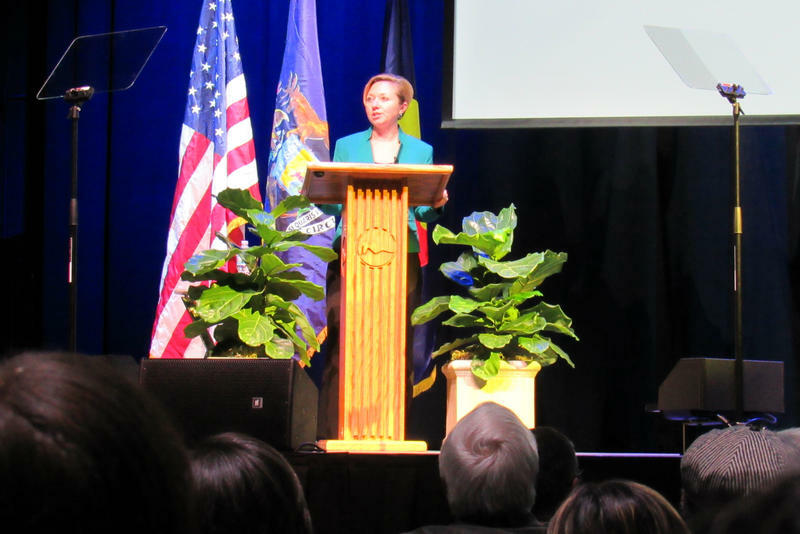 From its beginning in the 1970s, ICCF hoped to spark private investment by building “where no one else would,” VerWys said. The homes they build are simple, but very nice. He says they want to build more than just a cheap roof over someone’s head; beauty is important. ICCF built my house in 2005. We added the garden on the right, unearthing bricks, glass, and caution tape presumably left over after the two houses were razed. Since then, he says ICCF has built or rehabbed more than 400 single family homes. But he says construction costs have been much higher lately, and housing subsidies are low, causing the non-profit to pivot away from building. 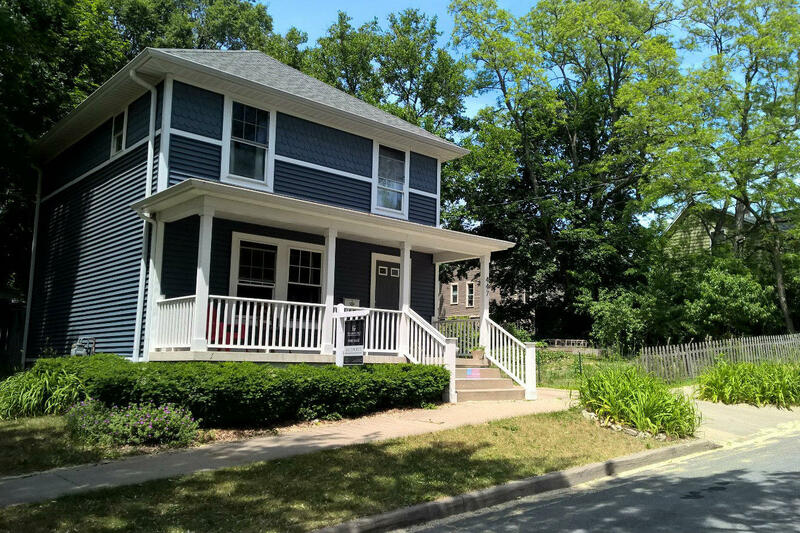 Instead of building and potentially bumping up the prices of housing nearby, VerWys says the focus has been on “preserving” Baxter’s population – those neighbors I fell in love with when I bought the place. Most of them are black and African-American people who have lived here for decades. He says ICCF has more than 500 people on a waiting list for an affordable place to live. The pressure is mounting on them and similar organizations to do something about the housing shortage. He says ICCF will make a major announcement on a new effort later this month. My next-door neighbor, who used to serenade me with Broadway show tunes from his balcony, was forced out of his apartment after living there eight years. The rent was going up by hundreds of dollars a month and the Navy veteran could not afford it on his fixed income. Higher rents have forced out at least four other families on my block in the last year and a half. The same month I listed my house for sale, one of my favorite neighbors was kicked out of a house she had owned for years. The thing all of my neighbors who've been pushed out have in common is that they are black, and their incomes could not rise fast enough for them to be able to stay in their homes. Most every day, many times a day, we’d greet her walking her little Chihuahua around the block. Her daughter checked on her every day, many times stopping by our house to say "hi," or "thanks" for the garden produce, or plowing the snow all the way up the hill to her mother’s front door. My neighbor suffered from dementia and was apparently sold a reverse mortgage, draining the equity from the home. The thing all these neighbors have in common is that they are black, and their incomes could not rise fast enough for them to be able to stay in their homes. “Calling all urban gardeners!” the listing for my house started. We settled on a list price of $110,000. Comparable homes that sold nearby were all over the map price-wise, but the vast majority in Baxter still sell for $100,000 or less. We were hopeful. We also needed it to appraise. It “went live” early on a Wednesday afternoon. By the time I got home from work, the “slow roll” parade down the hill in front of my house had begun. People waved and shouted questions out their car windows about the basement as I pounded garden stakes into the ground. By Thursday we had so many showing requests coming in we decided to add a second open house. On Saturday, eager shoppers showed up more than a half an hour early for the first open house. My realtor brought a stack of fliers with information about our house. In less than two hours, all 60 were gone. The second open house was equally crazy. We may as well have had a third open house Monday evening, when 22 more people had “private” showings. On Tuesday, my inbox was an absolute flood of offers. In total, we got 49 offers on the house. A new record for my realtor, who’s been in Grand Rapids real estate for 15 years. Eight were cash offers. 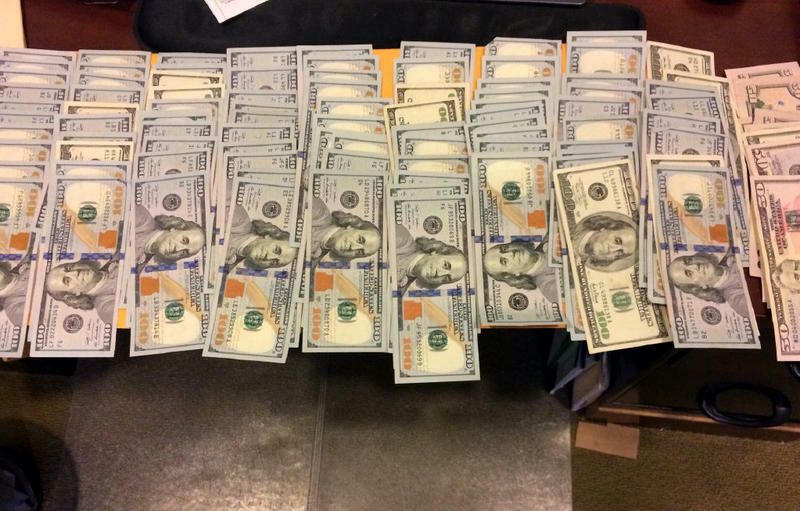 One guy literally sent a picture of stacks of 100 dollar bills on a glass desk. At least five offers came from investors. 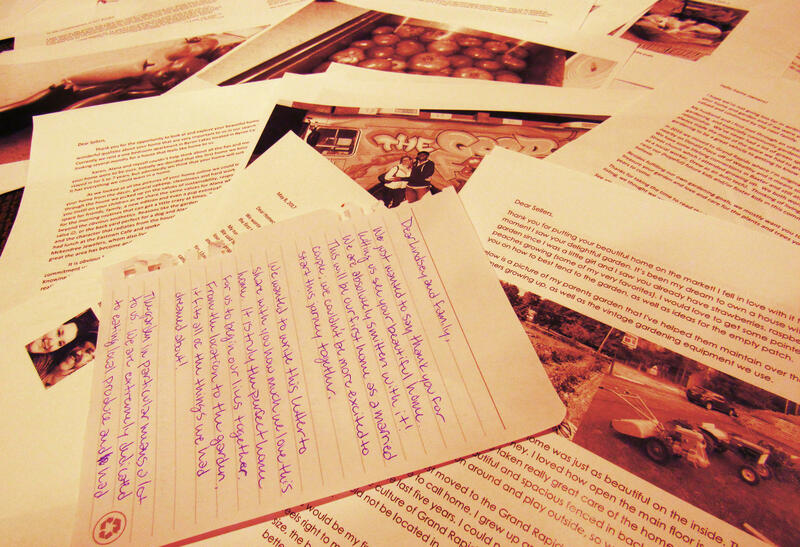 Eighteen offers came with love letters. Love letters that, taken together, sort of broke my heart. 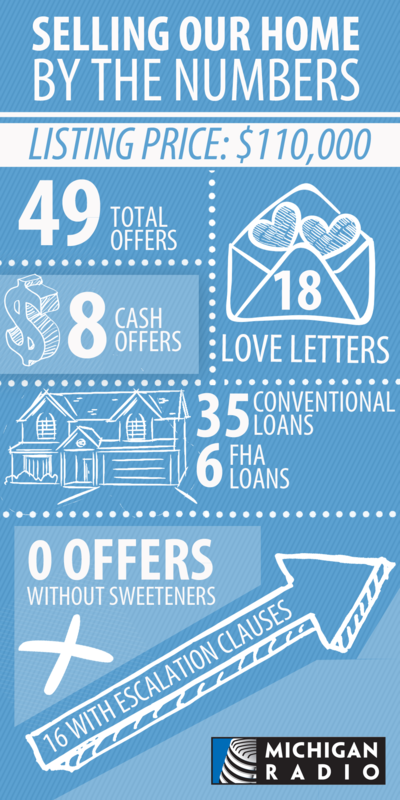 18 potential buyers wrote us "love letters" and pictures with their offers. There were at least a dozen first-time homebuyers in the bunch. A 26-year-old special education teacher who volunteers with a Christian organization for teens wrote that he had been house hunting for six months and was planning to pop the question to his girlfriend. A young florist gushed over the potential to open a studio space in my basement and mentioned she and her husband wanted to start a family. A 25-year-old recent CMU grad detailed why he decided to enlist in the Army National Guard and that he was currently commuting to Grand Rapids from his sister’s house in Muskegon, while he continues to look for a home. One couple “extremely dedicated to eating local produce” left a handwritten note on the kitchen table, noting this was the first time they’d be able to buy a house as a married, gay couple. It was a couple who met through a community garden in Chicago that won my heart. They grew up nearby, both worked nearby and still went to church in the middle of Baxter. They wrote they wanted to raise kids in the house I lovingly started my family in. People sent me pictures of themselves (almost all of them white), smiling with their kids, their garden plots, their dogs adopted from the humane society. They were all perfect, honestly. I’d love to have any of them as my neighbors. “It is heartbreaking, really,” my realtor Michelle Gordon told us. We were thrilled to get so much attention, but we knew no matter what decision we made, 48 families were going to be really disappointed. "I used to love getting multiple offers, still do, don't get me wrong. But I used to think and know 'these other people will eventually find a place of their own.' Now I'm not so sure," Gordon said. It wasn’t easy picking the “winner” either. Call us softies, but my husband and I both cried over the decision. This will always be our first house, with the first real garden we planted, full of memories with the two babies we had here. “This is a big dilemma,” ICCF’s Ryan VerWys said when I told him about my experience selling my house; the house ICCF built. “Appreciation of assets helps make the American Dream,” he said. But, we agreed, if every decision was made to simply maximize one’s own assets, poor and marginalized groups of people will lose out again and again. “You have to be intentional” about these kinds of decisions to make a difference in other people’s lives, he said. Of course, I wasn’t able to put finances completely out of the equation. But we did not accept the highest offer. We decided accepting the highest and cleanest offer was the best route for us; no inspections, no contingencies, and the buyer said he'd bring cash to the table if the house did not appraise, so no surprises. I am happy to tell my neighbors who ask that I did not sell the house to an investor. The guy from Jenison who’s moving in at the end of this month wrote in his love letter that he plans to live there for a long time. I hope he enjoys our home and our neighborhood as much as we have. Say you’ve lived in your neighborhood for ten years and suddenly it’s become the place to live. Rents are rising, and you’re looking at having to move. What then? Stay Midtown might have the answer. The program aims to help working people in Detroit’s up-and-coming Midtown area stay there. Our conversation with Brenda Quick and Sakura Raftery. 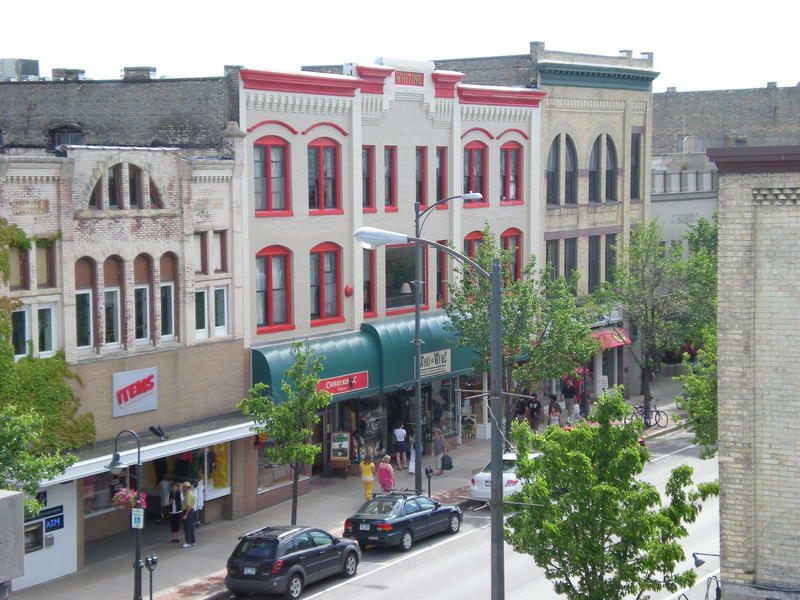 Quick leads the Save Our Downtown Movement in Traverse City and is an emeritus professor of law at the Michigan State University Law School. Raftery is director of housing for Goodwill Industries of Northern Michigan. What happens to a picturesque city when its charms draw more and more people who want to live or work there, and when the push for new housing threatens the very thing that made that city so special? Traverse City is wrestling with these questions right now, including the lack of affordable housing. 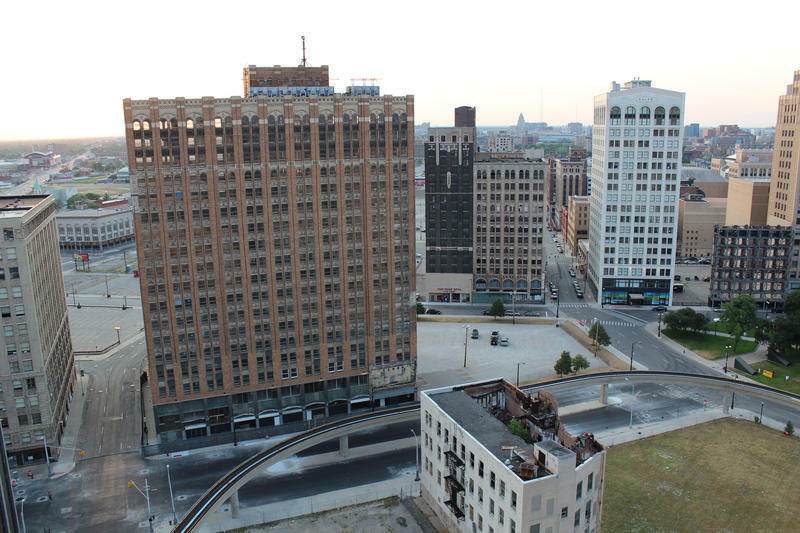 Advocate: Special deals for billionaires, why not for Detroiters hoping to stay in homes? That’s the opening salvo in writer Michele Oberholtzer’s opinion piece for Model D.
At one time, Detroit’s population was almost double what it is now. As people left, so did quality housing. That puts people still in the city at risk, Oberholtzer said.